Micrographia: Editorial Page: Welcome to a web resource for light microscopists. Some time ago, I watched a TV documentary on genetically modified corn. Two young men, genetic scientists from the company promoting the Bt corn under discussion, were assuring the audience that the tests which were being conducted in open fields posed negligible threat of cross-pollination with non-GM varieties in adjoining fields. They claimed that the nature of the pollen produced by their GM corn was such that very little was likely to make it into the surrounding fields. I was stunned -- they had effectively stated that their pollen was too heavy to go 50 yards. Earlier, TV news had shown dramatic footage of a hurricane which had picked up boats and deposited them inland, and had picked up trucks to dump them blocks away, and I was compelled to wonder -- if we have on Earth atmospheric conditions capable of dumping motor vehicles in distant fields, why are we being asked to believe that it won't happen with pollen grains? I mean, if a hurricane can levitate a motor car, surely a stiff breeze would be enough for a pollen grain. No? The po-faced pronouncements of this plausible-appearing pair were less a demonstration of scientific authority than an object lesson in how far well-educated people can go in making nonsensical statements in public when their jobs depend upon it. Given the efforts which the GM companies have invested in preventing attempts to accurately label their products, the sheer volume of GM cross-contamination which has already taken place as a result of open field "trials" has effectively granted them a fait accompli. It would indeed be a bold labeller who would now state that their corn or cotton-based product was totally free of modified genes. The question is not the narrow one of whether these products are good or bad for human health, but the far more important one of the potential threat they pose to the long-term stability of the complex relationships which have been established in the biosphere over billions of years of evolution. These are the relationships upon which all living creatures depend, and should not lightly be exposed to risk. Until the question is more fully addressed (it can never have a complete answer), accurate labelling is more than ever necessary to ensure that those who are opposed to the genetic equivalent of playing with fire do not unwittingly invest in dubious enterprises when they spend their money at the supermarket. Labelling is a valuable means of assisting informed decision making in an atmosphere awash with unspoken objectives and calculated disinformation. Here is a link to a paper giving reliable data on the dispersal of maize pollen. The Death of Eric Marson. Micrographia takes the opportunity of extending sympathies to the family and friends of the late Eric Marson. 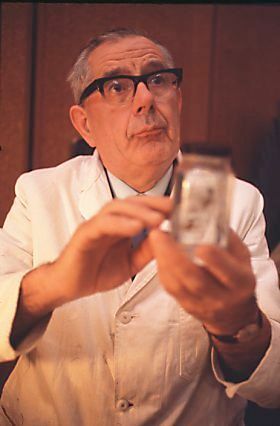 His skills in the fields of specimen preparation and slide mounting were legendary. I have a recollection of a Quekett Club annual meeting in the early eighties, standing with a group of people who watched as he mounted insects in balsam with a speed and precision which rendered us all silent with awe and admiration -- especially those of us who had tried it ourselves. He was the one-man show who ran Northern Biological Supplies with such constant application that most people who filled out their orders to NBS thought they were dealing with a largish company. Almost single-handedly, he addressed the problem faced by hobbyist microscopists of obtaining a diverse range of specialized materials, specimens and chemicals in quantities small enough to be affordable. In this way, he was one of the great enablers of amateur light microscopy for all of the people who bought his product, and who would have been hard-put to find that product elsewhere. Unless his business is carried on by others of the same energy level and devotion to cause, or a new provider enters the field, we of the microscopical community will have lost not only a unique individual but the unique and possibly irreplaceable resource he created. (Alas, a recent email from a colleague informs me that NBS will not be continued as a business. End of an era).